Project: What I Like about our Cultural Quarter – Art Competition. February 13th – March 6th, open Tuesday – Saturday 11-5.30pm & during evening performances. Creative Ireland, Garter Lane Arts Centre & The Cultural Quarter are proud to support What I Like About Our Cultural Quarter, an art competition open to art students from St Joseph’s Special School, Our Lady of Mercy Secondary School and St. Paul’s Community College senior cycle, with over 50 students taking part in this year’s project, it is set to be one to remember! Participating students took part in a guided walking tour of the Cultural Quarter allowing them to witness first-hand the area and its environment, they also visited Garter Lane Gallery where their final pieces will be exhibited. Taking part in this project has given the students and teacher the opportunity to have a glimpse at the changes happening around them and to contribute their ideas through visual art. Students were given the opportunity to take part in a facilitated workshop by local artists were they could tap into their creativity. Art works will be selected by a panel of judges and a number of artworks will be on display in Garter Lane Arts Centre Gallery in February & March 2019. 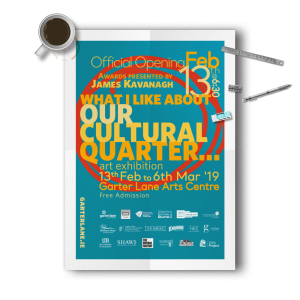 What I Like About Our Cultural Quarter is an inclusive project which gets the community and stakeholders involved, from the students, teachers, artists, those living in and around the quarter, the staff & patrons of Garter Lane Arts Centre, Creative Waterford, local businesses and representatives of The Cultural Quarter. The project is a Creative Waterford project and receives support from the Creative Ireland Programme Scheme. With special thanks to:The Vintage Factory, The Parlour Tea Rooms, Palmers Music Centre, Shaws Department Store, The Walls Project (Waterford Walls), H K Stuart, Leo Murphy Frames, The Granary Cafe, Dooley’s Hotel, The Candied Hazelnut, Flahavan’s & the Cultural Quarter.